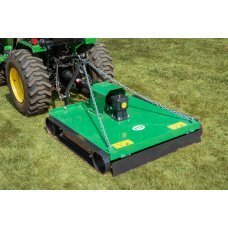 The Farm Tech TM topper mowers are ideal for topping grass, weeds, brambles, light scrub and saplings from pasture and paddock areas. The machine has a single blade carrier with two blades, one on each end. Fully adjustable skids for regulating cutting height and with 3 point linkage, suitable for most compact or medium sized tractors. Medium duty topper mower with re-enforced frame, designed with safety in mind the TM110 is fitted with stone guard for extra security. Sturdy steel structure gives both strength and reliability to this Topper.